The smaller and poorer the circus, the more limited the animals' access may be to water, food, and veterinary care. But whatever the size of a circus, the animals inevitably suffer. For information about specific circuses click here. Tigers and lions usually live and travel in cages 4 feet by 6 feet by 5 feet. Early in their training, according to Henry Ringling North in his book The Circus Kings, the big cats are "chained to their pedestals, and ropes are put around their necks to choke them down. They work from fear." Bears may have their noses broken while being trained or have their paws burned to force them to stand on their hind legs. Click here to download video of big-cat training techniques. A Hudson News reporter who traveled with Ringling Bros. 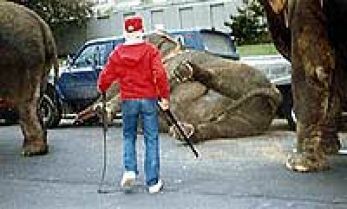 Circus reported in an article dated August 8, 1986, that the sound of a trainer's club repeatedly striking a chimpanzee, as well as the chimpanzee's screams, could be heard outside the arena building. Because of the enormous size and strength of elephants, most trainers rely on chains and fear to make them obey. Some elephants spend almost their whole lives in chains. The well-known Dumbo lived 20 years in "martingales," chains that ran from his tusks to his feet. In the wild, the life expectancy of elephants is the same as ours. In the circus, many elephants die prematurely of disease and the stress of confinement. Elephants in circuses are rebelling in attempts to escape their sad existences. Since 1990, elephants have killed at least 46 people and injured many more. 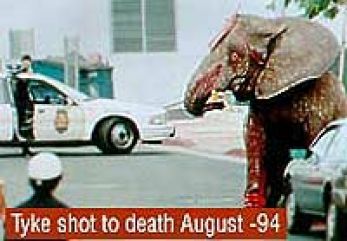 In 1994, an elephant killed her trainer and injured 12 spectators before being gunned down by almost 100 bullets while running terrified through downtown Honolulu. 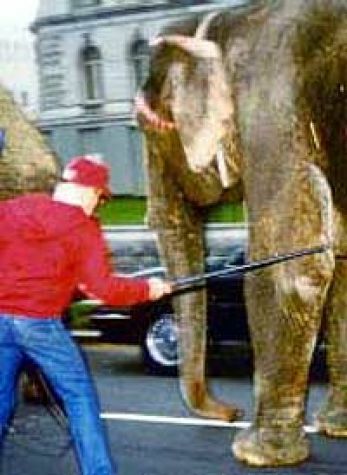 In 1994, officer Blayne Doyle, who had to shoot 47 rounds into Janet, an elephant who charged out of the Great American Circus arena, lamented: "I think these elephants are trying to tell us that zoos and circuses are not what God created them for. But we have not been listening." Click here to read more about the risks of performing animal attacks. People are listening, and many communities are realizing that animals have no place in the circus. Because of this, and the inherent risk to public safety, many towns and cities are considering bans on animal acts. And click here for the growing list of animal-free circuses.